The Hermitage Club is the Yellowstone Club of the East. You pay to play here, initial membership is $75,000, and the play here is top-notch from the exclusive ski area to the magnificent $30 mill Clubhouse complete with a Spa, movie theatre, bowling alley, and game room for the kids. If you think Hermitage Club sounds stuffy or snobbish, you might be surprised. There’s a family-friendly casual elegance here at Haystack Mountain where Hermitage Club members carve up corduroy and float threw fluffy untracked powder on 1,400’ vertical served by five lifts all day. A grand buffet is served by the massive stone fireplace at lunchtime. Kids are with their instructor and new friends exploring the mountain. Afternoon brings Clubhouse Spa treatments, après ski with a slope view bar, while the kids enjoy their own zone downstairs. Far from stodgy, members aren’t just bigwigs, their social and stoked for adventure, and the Club caters with snowmobiling on Haystack after the lifts close, snowshoeing or taking the snow cat “Catillac” up to the summit Cabin for cocktails at 3,200’, or skinning up the mountain for a moonlight ski down. The 1964 Haystack ski area that struggled for years is now a haven for wealthy ski families looking to escape from lift lines and crowded base lodges, preferring to ski and socialize with like-minded families that enjoy the luxury of being catered to. The Vermont scenery is serene at the private club on Haystack Mountain – right next door to Mount Snow, the mood is fun and family oriented. Hermitage Club founder, Jim Barnes, set the tone – entertaining his members with a top 70’s bands on Saturday night at the Clubhouse or providing cat skiing to members on Mondays when the lifts aren’t running. So far, 500 families have become members of The Hermitage Club’s 1,500 exclusive spots. The question now is can teh membership sustain the Club through foreclosure and emerge as viable with new ownership. 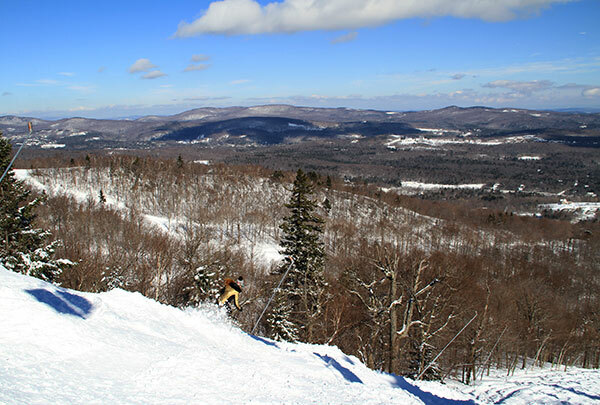 Families pay $5,600 annual dues after initiation, skiing included. You can then buy a house lot or a luxury unit in the Luxury Hotel and a Condo-Hotel being constructed by the Clubhouse. The benefits for active families that can afford Hermitage Club membership is everything you love about skiing and vacation ownership, with none of the hassle. You arrive and yours skis, slopes, meals and lodging are prepped to perfection – the concierge staff awaits. Next season members will be whisked up the mountain on a brand new six-passenger heated-seat bubble-covered chairlift, a $7 million high-speed lift like Okemo’s – for a fraction of the skiers. There’s a heli-pad, and an airport for members, even a jet share program from The City.